Select Components → Banners → Categories from the drop-down menu of the Joomla! Administrator Panel. You can also select the 'Categories' menu link from the Banner Manager, Banner Clients Manager or the Banner Tracks Manager. The Banner Category Manager is where you can edit existing Banner Categories and create new ones. Note that Banner Categories are separate from other Categories, such as for Articles, Contacts, News Feeds, and Web Links. 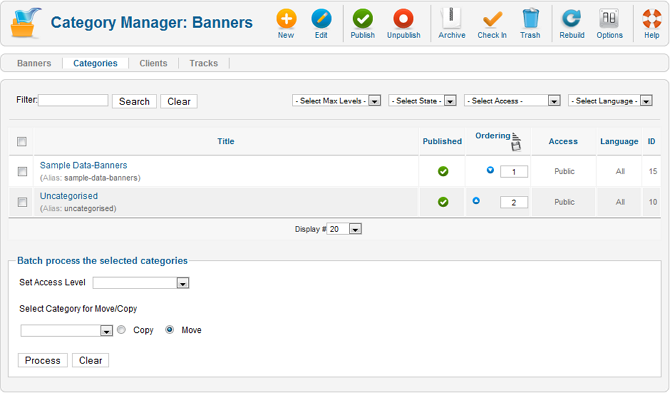 From this screen you can navigate to the Banner Manager, Banner Clients Manager and the Banner Tracks Manager. You must add at least one Banner Client and Banner Category before you can add a Banner. Title. The name of the Category. This entry is required. You can open the item for editing by clicking on the Title. Ordering. The order to display items. If the list is sorted by this column, you can change the order by clicking the arrows or by entering the sequential order and clicking the 'Save Order' icon in the column header. Access. The minimum access level that has the ability to view this category's banners. Language. The language of the banner. You can filter the list of items by typing part of the category's name. Only items matching the selected Max Levels, State, Access and/or Language will display in the list. Select Max Levels. Use the drop-down list box to select how many child categories to display. For example, selecting 1 will only show the top level parent categories. Selecting 2 will show the top level parent categories and also the first level of child categories. Select State. Use the drop-down list box to select the published state: Published, Unpublished, Archived, Trashed, or All (any). Select Access. Use the drop-down list box to select the access level. Select Language. Use the drop-down list box to select only categories of the selected language. New. Click on this button to create a new category. You will enter the New page for this item. Edit. Select one category and click on this button to open it in edit mode. If you have more than one category selected, the first item will be opened. You can also open a category for editing by clicking on its Name. Publish. To publish one or more categories, select them and click on this button. Unpublish. To unpublish one or more categories, select them and click on this button. Archive. To put one or more categories into the archived state, select them and click on this button. Check In. To check-in one or more categories, select them and click on this button. Trash. To trash one or more items, select them and click this button. The selected items will be placed in the trash. Note: Only empty items can be trashed. Rebuild. Click this button to rebuild the category tree data. Options. Click this button to open the Banners Global Configuration window. This window allows you to set default parameters for Banners, as shown below. Help. Display this help screen. Categories. This link is disabled, since you are already in the Categories page. Set Access Level. Use this drop-down list to select an access level. Select Category for Move/Copy. Use this drop-down list to select a category to move or copy the selected categories to. Use the radio button to select either a move or copy operation. Process. Press this button to execute your batch processing settings for the selected categories. Clear. Reset your batch processing settings selections.